Today we have some classic front pages. There is one story that you have to lead on ... but nothing new has happened. How do you deal with that? That's when the page designers must be at their most creative and, today, with one or two exceptions, they haven't disappointed. The Mirror, Telegraph and Express all use similar images. 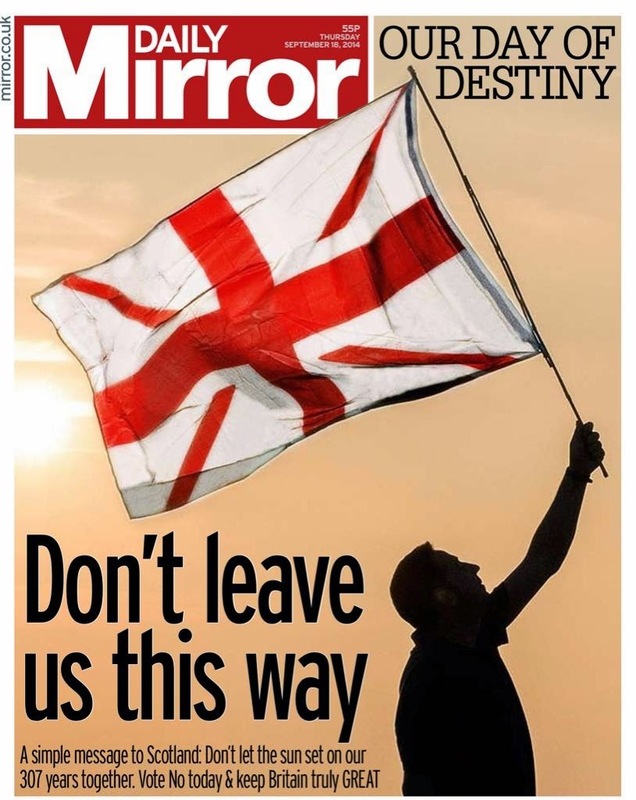 The Mirror takes out the Saltire from the Union Flag and headlines with a slightly amended song title, made famous by Scottish band the Communards. A smart page for both England and Scotland. With big picture stories, the broadsheet size comes into its own. And the Telegraph rarely misses an opportunity. 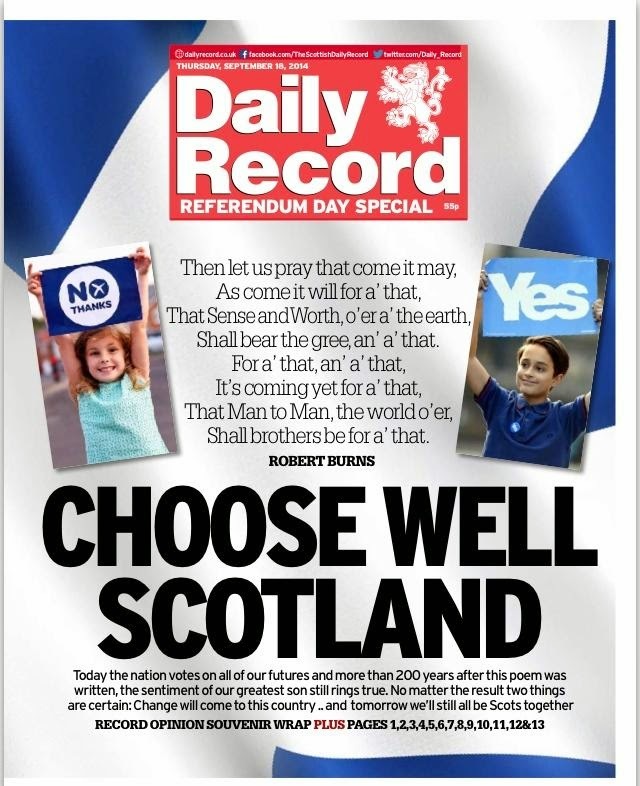 No headline required, just a poignant quote from Rabbie Burns. 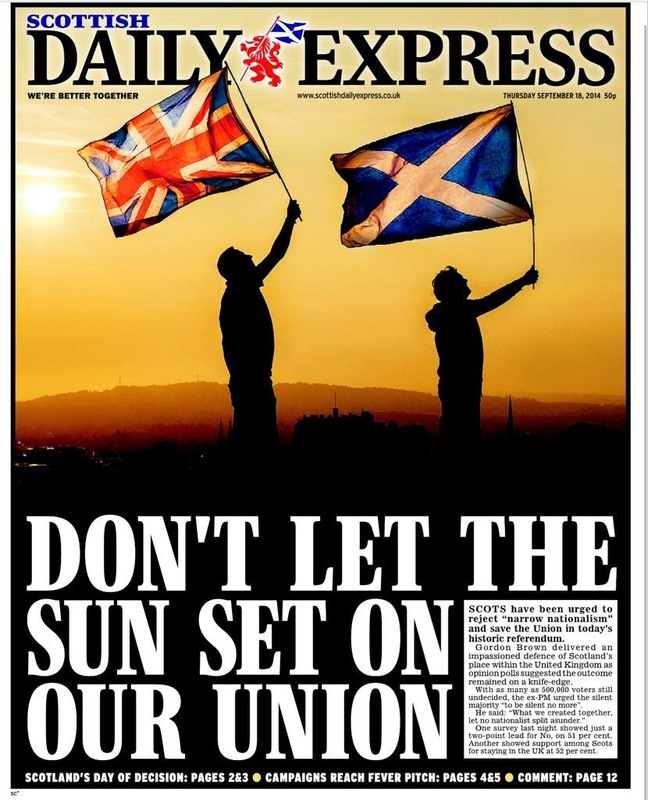 The Express uses a similar image in Scotland but in England reverts to a more traditional front. I guess it is so they could promote their historic newspaper pages. The blurb has looked the same every day this week though. I also have an issue with Free Inside in bright yellow - where else would it be? In the shop next door? I would have been tempted to have run the Scottish page in all editions. 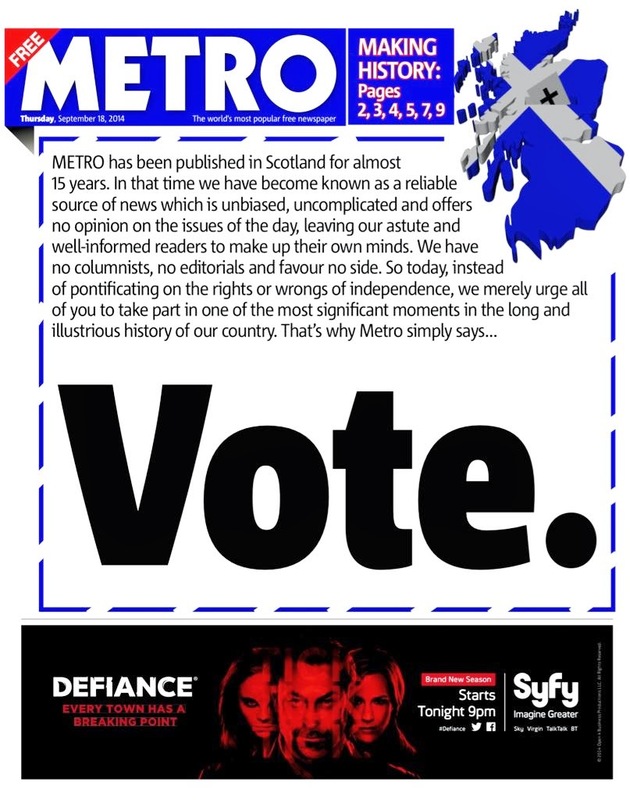 The Daily Record has had a good campaign and today it delivers two excellent fronts. The top one - which also quotes Burns - is part of a wrap, the bottom one the front page inside the wrap. All to Pray for is a clever headline too. I wonder if Alistair Darling should have been replaced by Gordon Brown in the head to head. 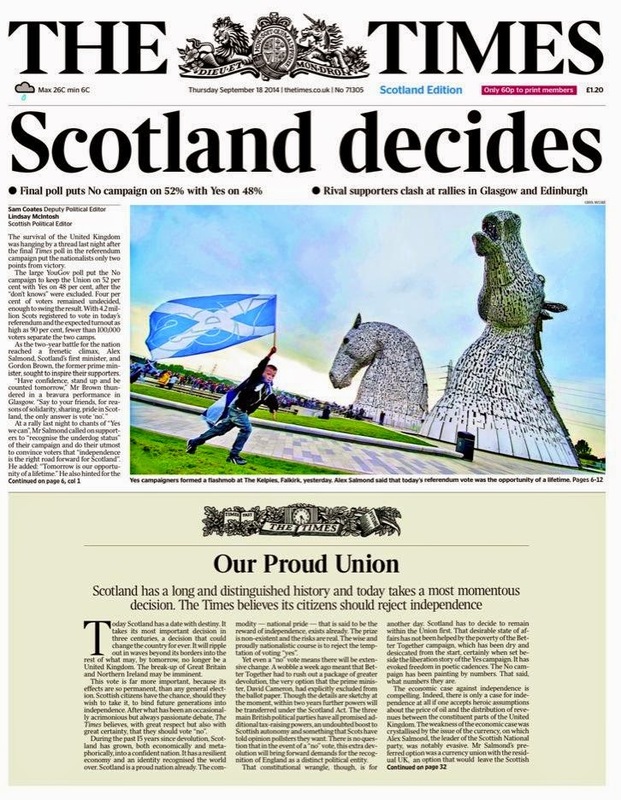 The Times also goes with a wrap in both England and Scotland. Given the great wraparounds the Times has delivered, this is a little disappointing. 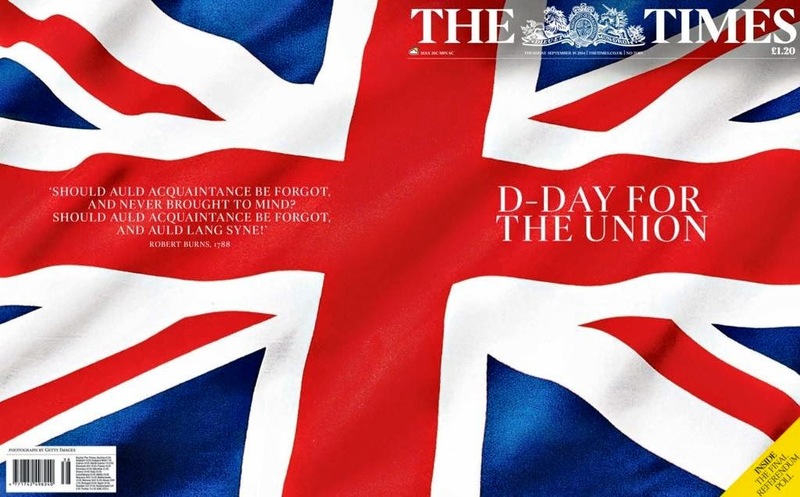 It's just a poster of the Union Flag and a fairly routine D-Day headline. 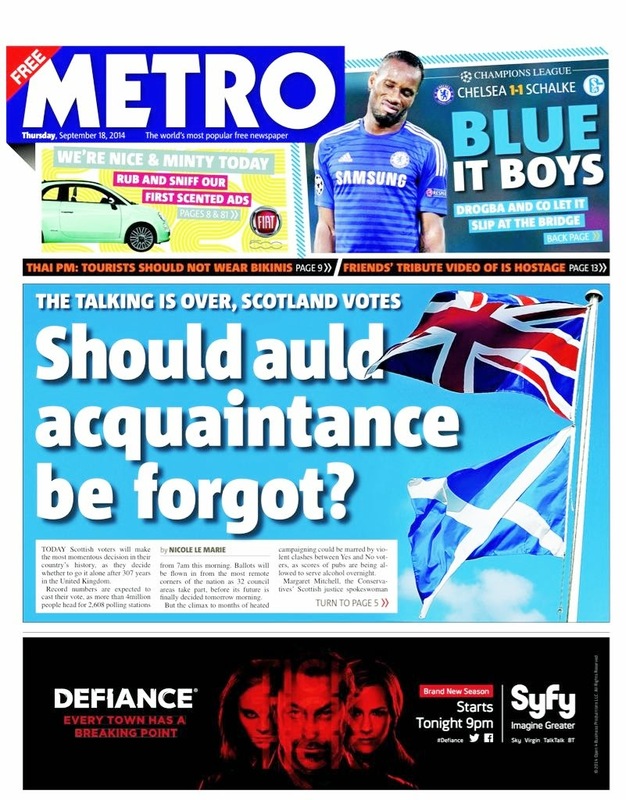 Scotland decides isn't the most creative headline of the day either. 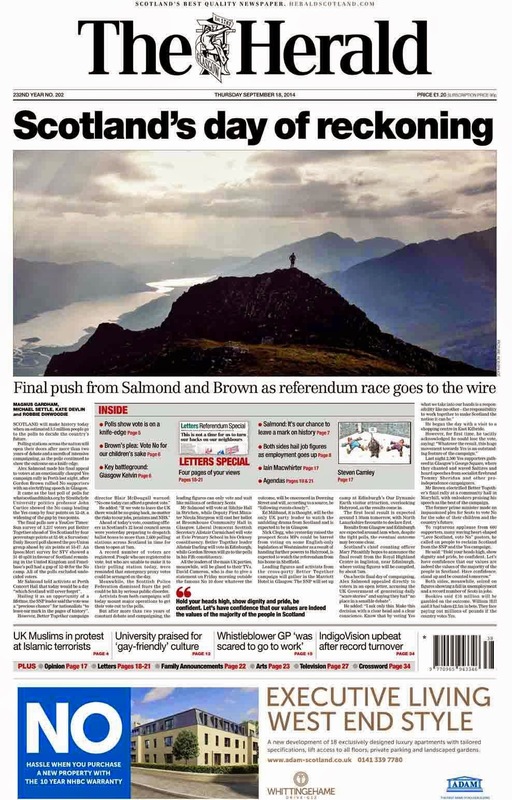 In Scotland it takes the unusual step of running its editorial - in leader page style - on Page 1. 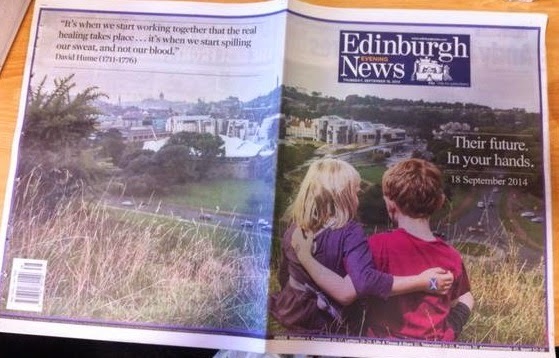 I am not sure about simply cutting the page in half and some readers may think it's an ad. It certainly looks different, though. 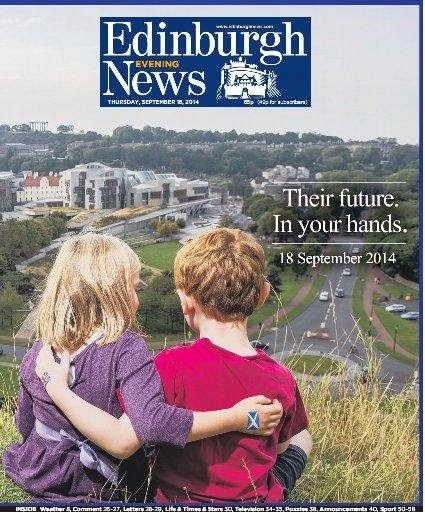 The Edinburgh News is yet another paper to go for a wraparound. Away from the flags and politicians, it brings the issue back to its nub. The headline and David Hume quote work well. A really nice page. I really like the Daily Mail's Scottish front page and there might have been an argument in running it through all editions. 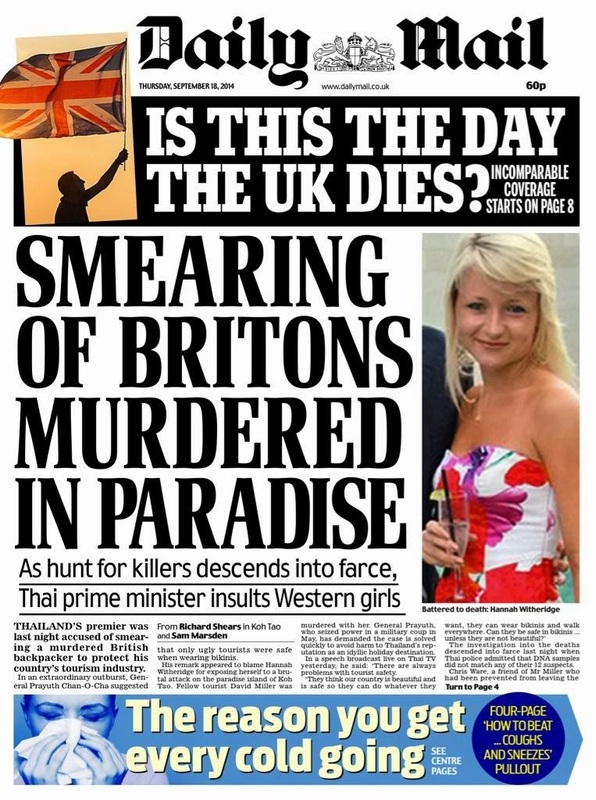 The Thailand murder story is strong though. 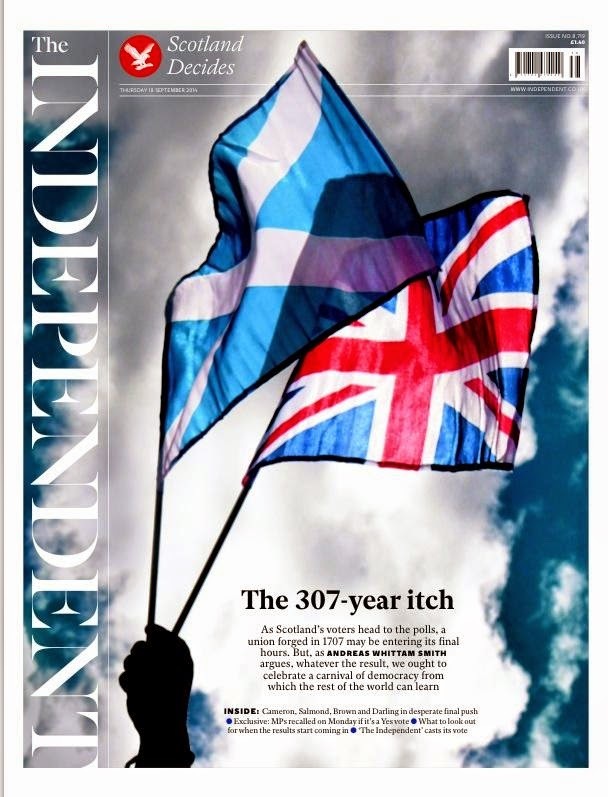 The Independent also goes for a dramatic Saltire and Union Flag picture, which looks very powerful on today's news-stands. The 307-year itch is nice too. 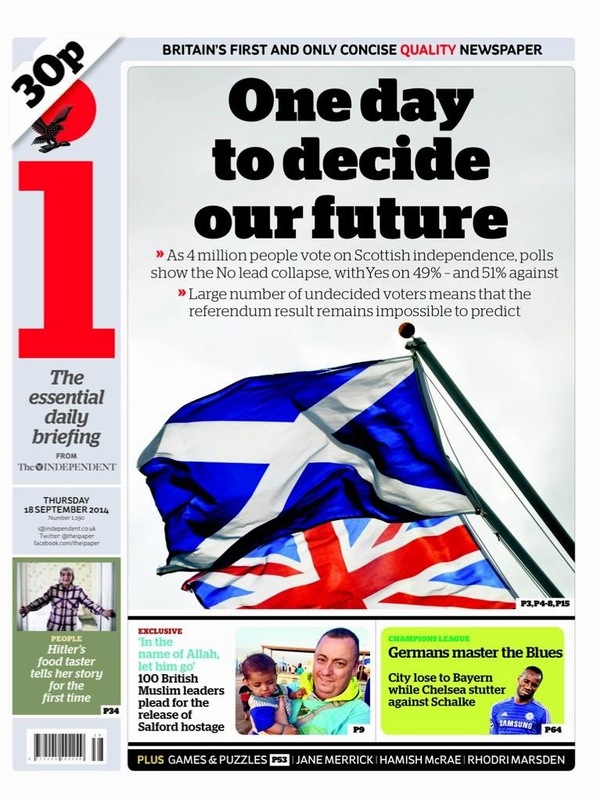 Its sister paper, the i, goes for the two flags - but doesn't quite have the same impact. I have been impressed with the recent changes to Metro. This is another strong front with yet another song lyric headline. 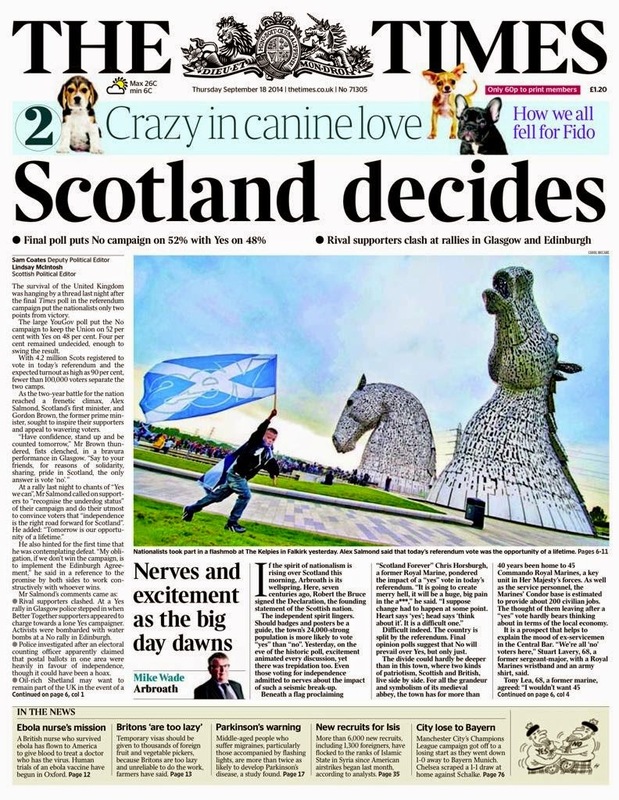 I really liked the Scottish Page 1. It says 'we have no columnists, no editorials and favour no side. 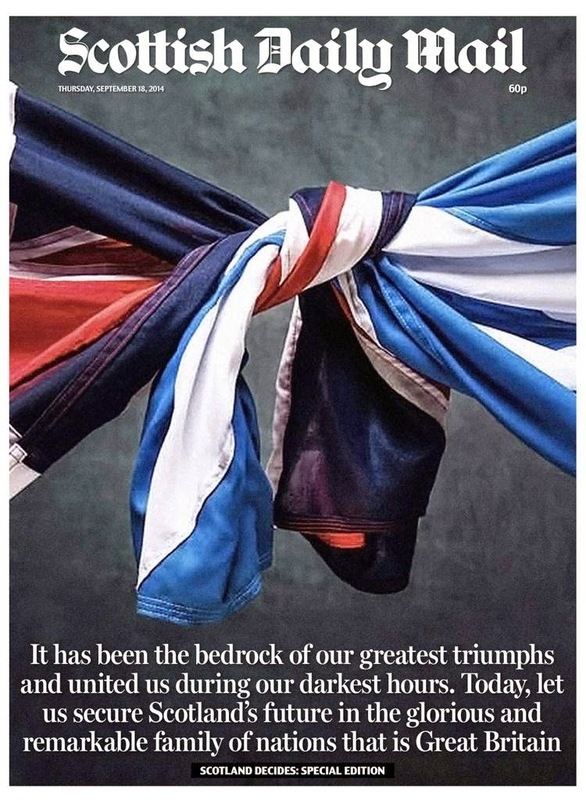 So today, instead of pontificating on the rights or wrongs of independence, we merely urge all of you to take part in one of the most significant moments in the long and illustrious history of our country.' Hope readers don't think the advert is a message too. 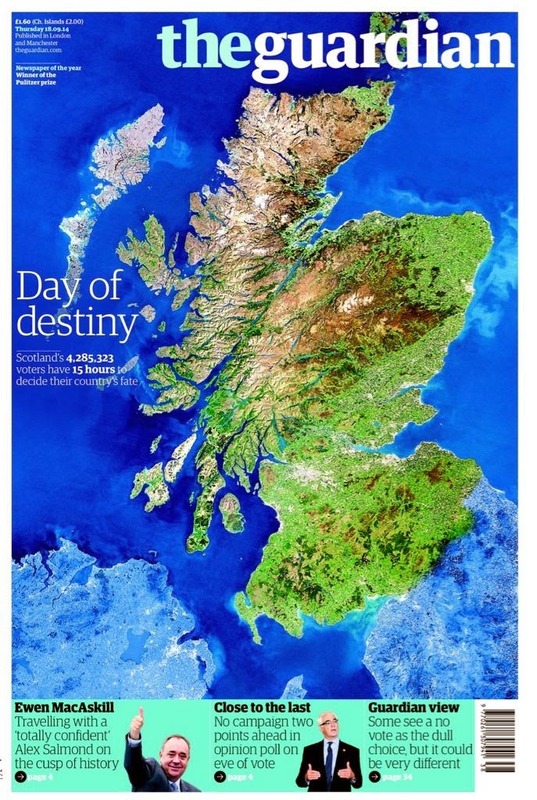 The Guardian wipes out the front with a satellite shot, showing what Scotland would look like as an independent country. Day of destiny is the most-used headline of the day. 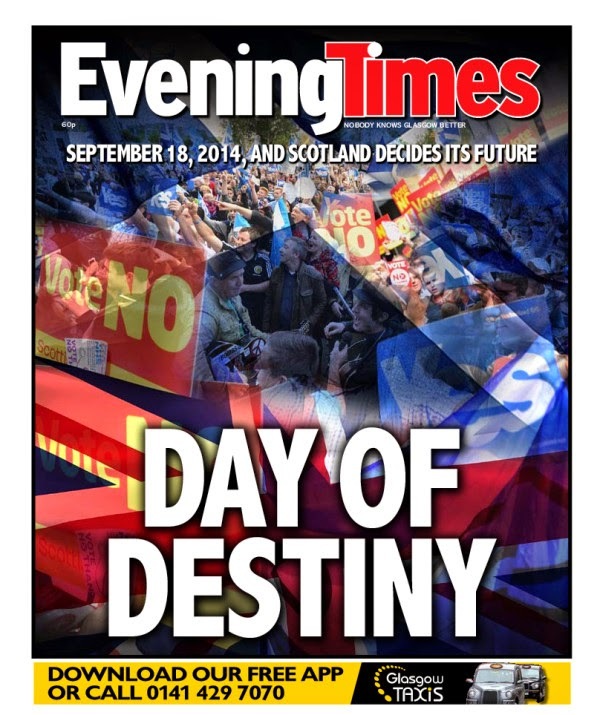 The Evening Times also uses Day of destiny on a montage of campaigns and flags. The Sun, in its unique and innovative way, contrives to tie in Harry and Cressida getting back together with the Scottish issue. It is, as you may know, also a song title (Jack Johnson, anyone?). The Scottish edition is interesting too. I am with journalism trainees today who feel the hands weren't needed. 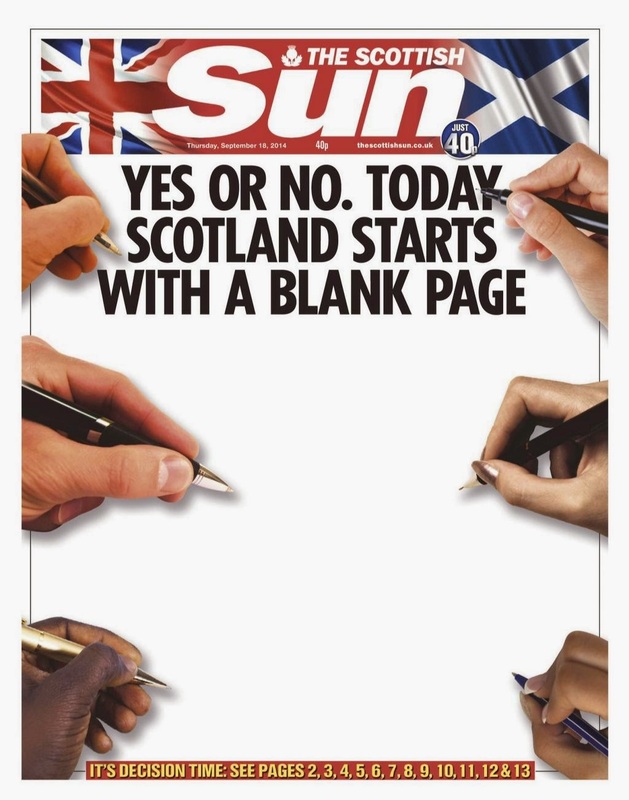 I am not sure The Sun would have been confident going with just a blank page though. The multi-cultural hands are writing the new beginning I guess. I might have subbed the cross reference to Pages 2 to 13. 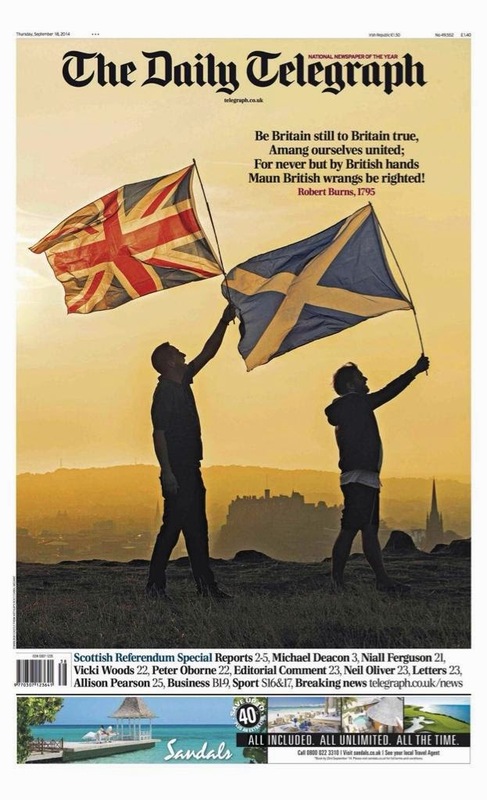 The Herald has a powerful picture of Scotland at its archetypal best. The advert is interesting though - it has to be deliberate. 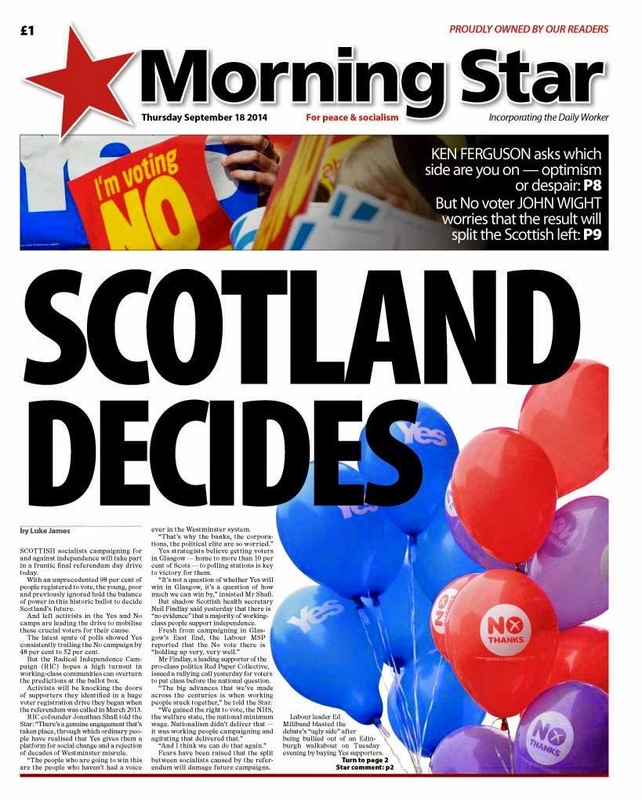 At both ends of the spectrum, even City A.M. and the Morning Star go for Scotland. The Racing Post is interesting too. 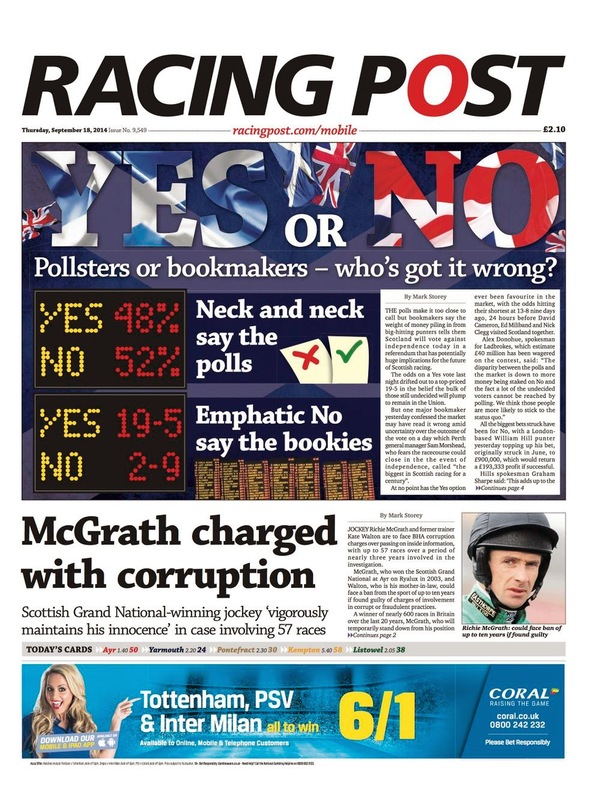 Never mind the polls ... the bookies are offering odds of 2/9 on the No vote. And the bookies are rarely wrong. 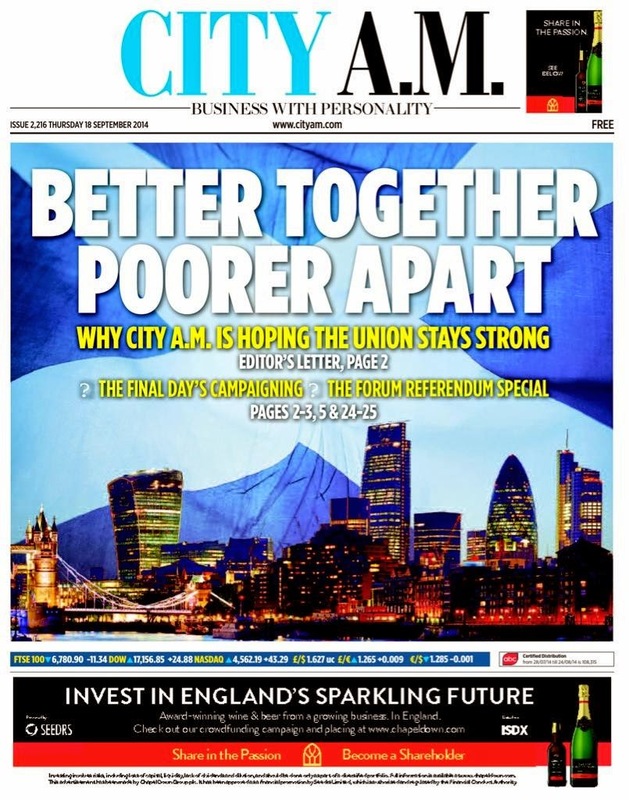 Perhaps the most disappointing front is The Scotsman's. 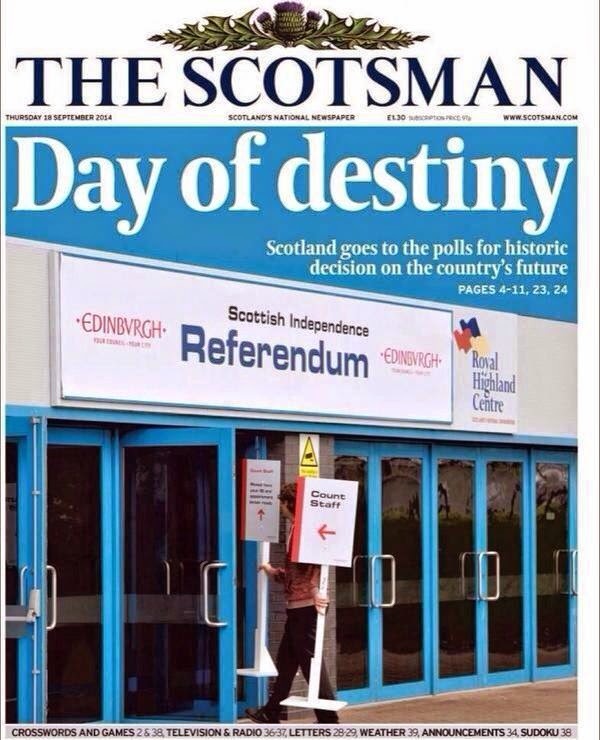 The Day of Destiny headline makes a reappearance ... but is this really the best picture? Pictures of buildings rarely make great display images for newspapers and this isn't even a nice building or a moody shot. It also looks as though the signs are being put away after it's all over. Some thoughtful and creative pages today - newspapers at their best. With the result coming in after deadline, tomorrow's fronts will be even more of a challenge. 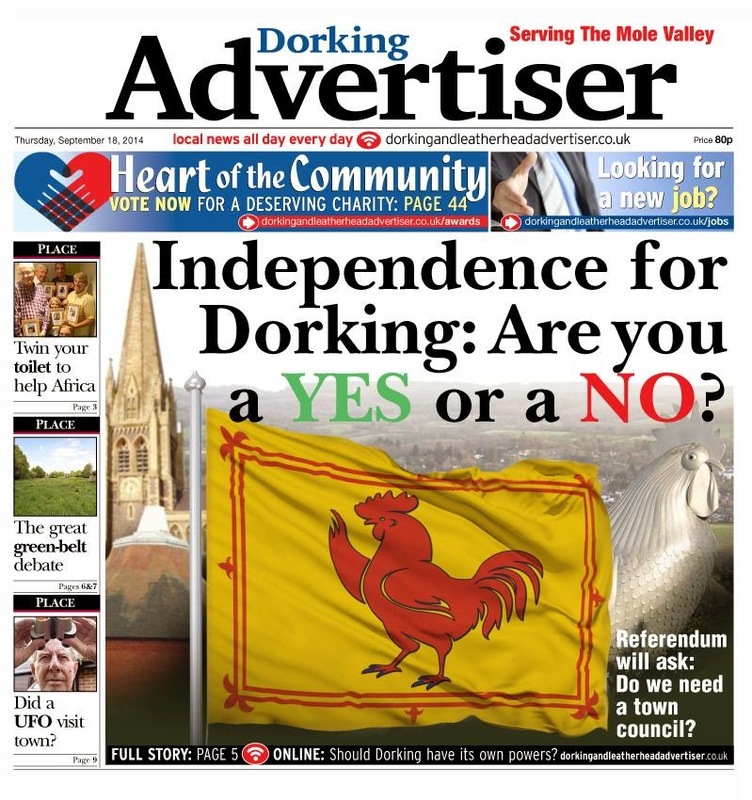 When all the debates have run their course, I think every sane person will agree - the UK is better off without Dorking.